After last years success, we are sticking to the same format. There is no set theme so the choice of songs are yours. A new section has been created for Non-Competitive Choirs. Number limits do not apply. See page 38 of the Schedule for more details. WAPAE was successful in receiving a $5,000 grant from South32 Worsley Alumina towards the cost of our venue; BREC. Some of our committee met with Worsley Refinery Vice President Dino Otranto for a photo for their newsletter. We liked the photo so much we have included it in our e-News as well! WAPAE along with probably most of the not for profit organisations in Bunbury, has had funding cuts. This is true – however the Eisteddfod will be going ahead – at BREC, in June. We are also heading towards our 60th Anniversary and we will continue to seek funding here, there and everywhere to continue this great Iconic Event. The committee is working hard to apply for grants and other funding sources, and are asking the local community for their support by becoming a sponsor. A newly reformed Sponsorship package is available upon request. 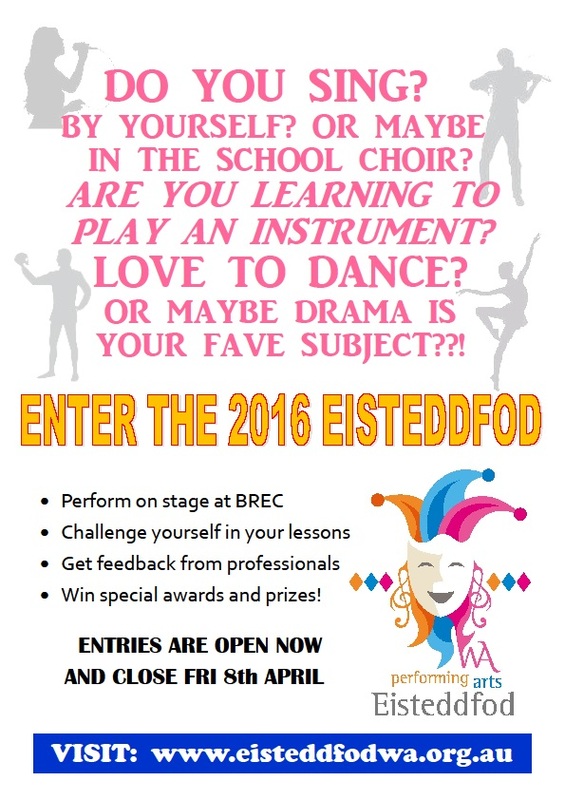 Tell your family and friends about the Eisteddfod- mark the dates on your calendar, print out and display our poster, share us on Social Media!